"Those who don't believe in magic will never find it." That quote, found in Roald Dahl's very last book The Minpins, lingered on my mind as I walked around Dahl's gorgeous farm house in England. 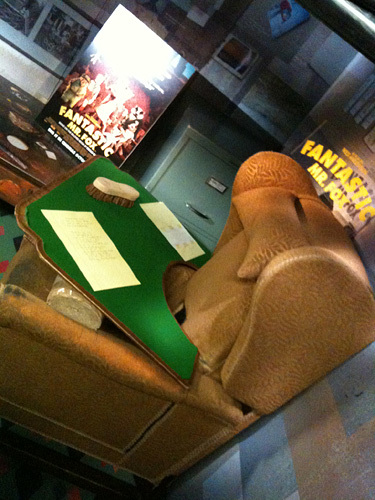 A month ago, Fox Searchlight invited a small group of web journalists to London, England and the town of Great Missenden to visit the Roald Dahl Museum as well as his estate. While I was out there, I interviewed both Wes Anderson (watch that video) and Jason Schwartzman from Fantastic Mr. Fox, which is based on a Dahl story. This trip wouldn't have been as wonderful as it was if I weren't already a fan of the film, which I saw before I left. Anyway, let's get back on track, as this was more about being immersed in Roald Dahl's world. As Americans, I'm sure some of you aren't as familiar with Roald Dahl as other authors like Dr. Seuss or Maurice Sendak. In England, it's the complete opposite, and everyone grew up with Dahl and loves him. This museum, located in the beautiful town of Great Missenden in Buckinghamshire, UK, is designed to not only educate people about his life and who he was, but spark their imagination and get them writing as well. 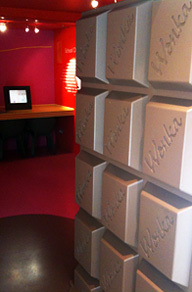 It's a small museum, superbly put together, with wonderful charms like a giant chocolate door that enters into a room that even smells like chocolate (seen to the right). It all kicked off with a quick 40-minute train ride from London to Missenden in a train that was all decked out with Fantastic Mr. Fox posters and decoration (check out a photo). We arrived and walked to the museum, which is about five minutes from the train station, and enjoyed a breakfast containing some delicious Roald Dahl-inspired food. We were given a brief presentation and taken on a quick tour of the museum, which contains two primary exhibit rooms each with a biographical look at his life, and a "story centre" where visitors are encouraged to "dress up, make up stories, words and poems or get arty in our craft room." 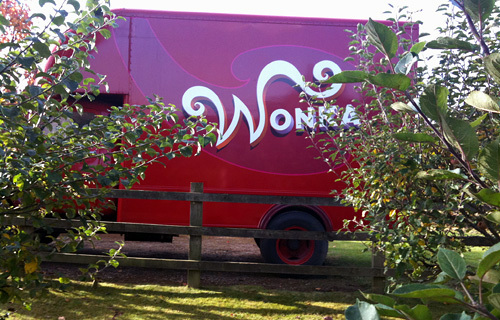 If you're a fan of Roald Dahl in the slightest, then you've got to stop by this museum. It's just as whimsical and fantastic as all of his stories and contains plenty of activities for up-and-coming writers of all ages. We spent most of our day here at the museum, so I was quite acquainted with it and thoroughly enjoyed it. It's not too big or too small. 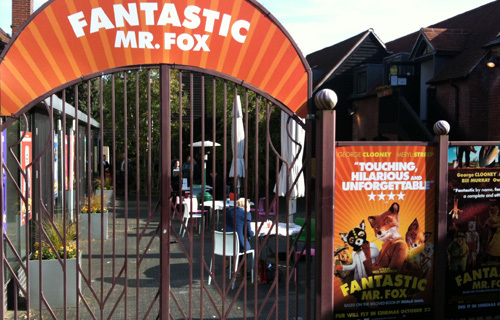 I've added a photo of the entrance below (covered in Fantastic Mr. Fox banners). Before I go on, I think it's best to give Mr. Dahl a more proper introduction. He was born in Wales in 1916 and later moved to the gypsy house in Missenden which is where he wrote most of his stories (in a chair just like this one). He's the author of such beloved children's books as James and the Giant Peach, Charlie and the Chocolate Factory, Danny the Champion of the World, Matilda, and of course, Fantastic Mr. Fox. He died at the age of 74 in 1990 but his legacy still lives on. His wife, Felicity Dahl, still lives in that same gypsy house, which is where we visited. 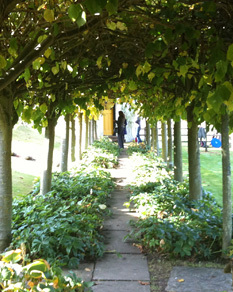 And she's done an extraordinary job keeping the place looking beautiful. I've been on a few farms in my life, but this place was gorgeous. The best part, though, was the tour. In addition to the house, his estate contains some beautiful rolling fields, plenty of gardens, even a miniature maze that his wife created in his memory. And as we'd pass by certain places, our tour guide would explain how each of these areas were inspirations for certain parts of his stories. But of course, being there for Fantastic Mr. Fox, I was looking forward to hearing about that the most. At one point near the back of the estate (right near where we found that truck below), a field stretched out towards some trees in this distance, and we were told this is the spot where he'd stand and envision Mr. Fox living. Standing there, I felt like I could see that Mr. Fox staring at us in the distance, just like in his stories. That photo you see to the left is the exact path that Roald took every day to his hut at the end where he wrote his stories. 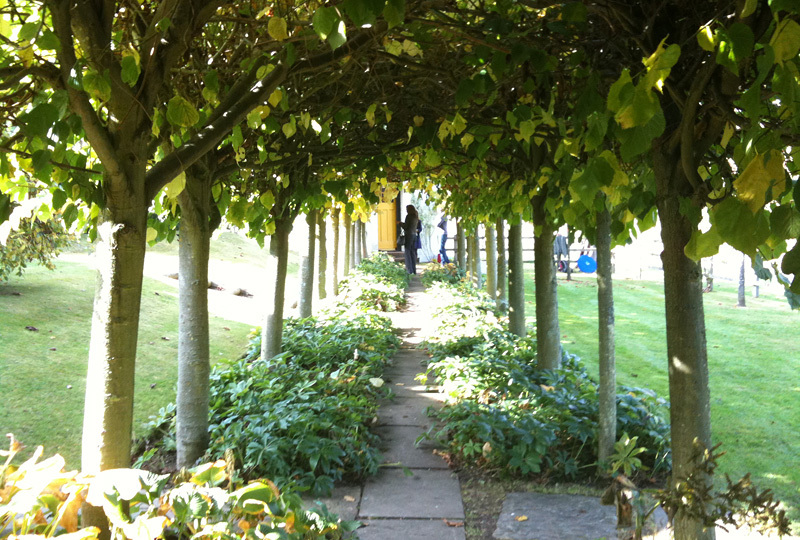 The path was covered from one end to the other with lemon trees (if I remember correctly) and was one of the most amazing places on his entire estate. I even had to go back to shoot a photo of it because it was so beautiful. This may sound cheesy now, but if you ever get to set foot on this estate, you can truly feel like you know where all of his ideas came from, because it's such a magical and wonderful place. And I felt honored to be able to stand where Roald Dahl himself had stood years before. 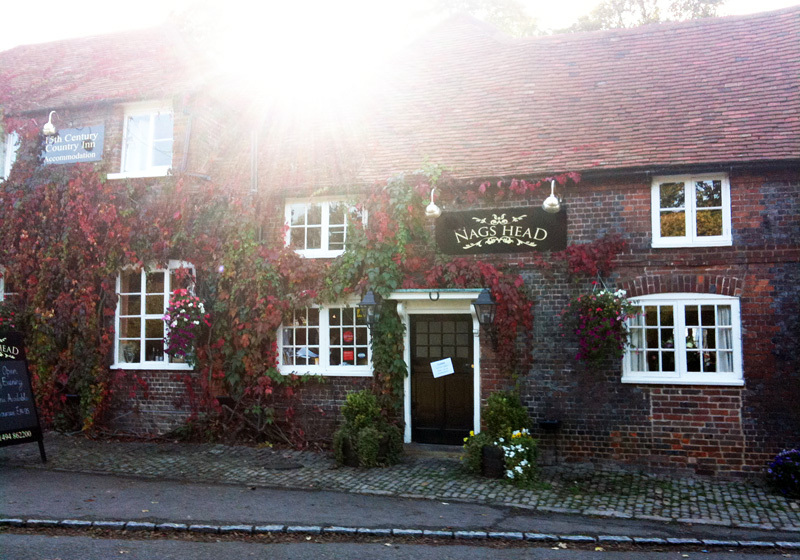 Before heading back to London, we were taken to the Nags Head, a pub just outside of Missenden that was actually seen in the movie. Wes Anderson and fellow auteur Noah Baumbach co-wrote the Fantastic Mr. Fox screenplay together. They were invited by Felicity Dahl to stay at the estate while writing to best immerse themselves in Dahl's world (just as I was able to). As Anderson explained at a press conference: "We tried to envision how Dahl would've expanded the story." And that meant including other Missenden locations like Nags Head, which shows up near the end of the film (when the critters start throwing flaming pinecones). This was another one of my favorite spots on the trip, as they served great beer (I got a nice tall glass of Guinness) and great food. It's a lot different inside, but I love the rustic old look of the place from the outside. Plus it's always cool to see actual real-life buildings that were featured in a movie. 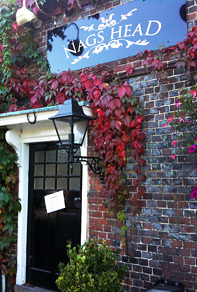 If I lived in England, I'd probably travel out just to eat at this place once a year, it was that good. I took a few shots of the place. One seen to the right, the other you can see by clicking the photo. I hope I was able to give all of you a taste of what it was like to venture out into the English countryside and dive headfirst into Roald Dahl's world. Similar to the Disneyland trip I went on a few weeks ago, Fox Searchlight wanted us to actually come to London and see what it was like in Great Missenden where Dahl wrote this story. "We put a man on the moon, but could not make this movie," Bill Murray joked at the press conference when talking about how this movie could only have been made in London and not in America. And it's for that reason that we couldn't have done these interviews and been immersed in Roald Dahl's world without going to England as well. And if you can't already tell, I had a really great time visiting all of these locations. It truly was a once-in-a-lifetime opportunity. As for the film itself, I loved Fantastic Mr. Fox. I was a bit hesitant going in, not sure if it would be as good as Wes Anderson's past work, but it was a fantastic film (no pun intended). It's charming, it's very fun (this is key), it's very Roald Dahl-esque, but with Wes Anderson style. I saw it before I even went on this trip and loved it then. Fantastic Mr. Fox hits theaters everywhere on Wednesday just before Thanksgiving this week. thanks for sharing, can't wait for this film. Loved all of Roald Dahl's books and am now enjoying sharing them with my children. Can't wait to see Fantastic Mr Fox, this was always one of my favourites to read out loud to my class. It never even mattered what age group, they loved every word.